PFA/FEP Lining offers highest corrosion resistance. Minimum lining thickness of 3mm, lining locked in dove tail grooves, slots and Holes in the body & plug castings. This prevents Liner collapse in vacuum conditions and blow out in high pressure conditions. 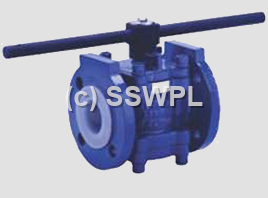 Lined Plug Valves have Body of Ductile Iron as per ASTM A 395 Gr-60-40-18 with Plug Made up of ASTM A 351 Gr CF8. Temperature: FEP –Max 180 Degree Celsius PFA Max: 200 Degree Celsius. Spark Testing of PFA/FEP at 15 KVA. Hydro Test at 15 kg/cm2. Hydro Seat Test at 10 Kg/cm2. Leak Test as per API 598.